If you’re like me, then you might be overwhelmed by the rash of green cleaning products that have come out in recent years. It’s hard to know which products are truly “green”, and which ones are simply hopping on the green bandwagon. And, that’s not all. Most of the traditional cleaners we have in our home are incredibly toxic. The EPA estimates that indoor air pollution is 2-5 times higher than outdoor air pollution, and a large contributor for this is our household cleaning products. And since most of us spend 90% of our time indoors, this is a problem for our long term health. This is why finding safe, green cleaning products is so important, not only for the planet, but for us as well. A few weeks ago, I got a package from EcoStore USA, a green cleaning company based in Birmingham, MI. I’d seen other green bloggers reviewing their products, and was interested in seeing if they were going to live up to the rave reviews I’d read about online. EcoStore was originally founded by a young couple living in an eco village in New Zealand. Because each household was responsible for treating and disposing of their own wastewater, it became obvious pretty quickly that traditional cleaning products were not good for the environment. So, they began to research ways to make a truly green, biodegradable cleaner that would leave the local waters pure for drinking and gardening. After a few years of trial and error, they figured it out. EcoStore New Zealand was born. They began to sell their products locally, mostly to other eco-minded folks. But after a few years they began to notice something pretty amazing; parents began writing in, telling them that their children’s health problems (like allergies and eczema) had cleared up once they’d stopped using traditional cleaners and started using EcoStore products. 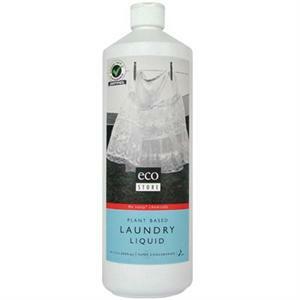 Because EcoStore products are plant based, they don’t put hazardous chemicals into the air when you use them. 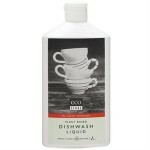 The dishwash liquid– Like all their products, the dishwash liquid is not petroleum based (meaning no oil was used to make it). It’s entirely plant based, and biodegrades easily. Also, none of their products are tested on animals. It has a very light citrus scent, and cleans well. It’s also thick; you could easily add a bit of water to it as you go along to make it last longer. The citrus spray cleaner– The EcoStore spray cleaner was definitely my favorite of the three. I absolutely love it! The main reason is because of the scent: it’s very light citrus. 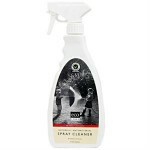 I normally use Mrs. Meyers Clean Day cleaning spray (I’ve used the lemon verbena and the geranium so far), and while it cleans very well, the smell can be overpowering. The EcoStore cleaning spray, however, was perfect. It smells very refreshing, and definitely won’t overpower your nose. And, I was very happy with how well it cleaned. The laundry detergent– The EcoStore laundry detergent is super-concentrated, which means you only need about 3-5 capfuls per load of laundry. They use 100% certified organic Eucalyptus oil in their detergent, and the base is coconut and palm oil. I’ve done several loads with the EcoStore laundry detergent by now, and I have to say that I’m impressed. Any detergent that will clean clothes with only 3 tablespoons of liquid (and in cold water, no less) gets five stars from me. This is another of their cleaners that had a fantastic smell; it’s a strong peppermint/eucalyptus scent. It will definitely revitalize your brain every time you take the lid off (but in a good way). Peppermint is one of my most favorite smells, and I loved getting a whiff every time I did a load. Again, I was impressed with how clean my clothes were with such a small amount of detergent. This bottle is going to last me forever at this rate. I loved all three of these products (if you couldn’t tell), and they get five out of five stars in my book. Their price is similar to the Mrs. Meyers Clean Day line, but you really don’t need a lot to do the job. My opinion is that they would last quite a long time (especially the laundry detergent). Another thing that impressed me about this company was that when the products arrived, they were packaged in the smallest box possible, with soy packing nuts. Everything was recyclable. If you live in Southeast Michigan, you can now find EcoStore USA products at Meijers. They also have a wonderful, well-sourced article up on their site about why you should care about your cleaning products, especially if you have children. I highly recommend giving it a read; you can find it here. I did generously receive samples from EcoStore USA for the purpose of this review. But I found nothing I didn’t like about these cleaning products. Hence the five stars. I’d be keen to hear about your experience with Ecostore refills?